Clifford Wade, whose family came west on the Oregon Trail, had a saddle made by an unknown maker, that his dad brought with him from the east. Tom Dorrance, who lived in Wallowa County, Oregon, cowboyed with Clifford and admired Clifford’s livestock handling ability and the saddle Clifford rode that he had inherited from his dad. According to Dale Harwood, noted Idaho saddle maker, in 1939 Tom Dorrance took Clifford’s saddle to Hamley & Company Saddle Shop in Pendleton, Oregon. He had a new saddle made on a saddle tree copied from the tree in Clifford’s old saddle. In 1940, Tom Dorrance was not satisfied with the fit of this saddle. He went back to Hamley’s and worked with Walt Youngman, head tree maker at Hamley’s, and they made some modifications in the saddle tree. At that time, Hamley’s made both saddle trees and saddles at their shop. 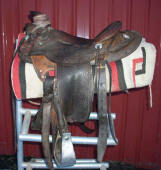 Dorrance continued riding this improved saddle throughout his long career as the premier horse psychologist. Hamley’s made more of these trees that Tom Dorrance and Walt Youngman had designed. They wanted to call them Dorrance trees, but Tom wanted the tree named after Clifford Wade from whom they had copied the original. Hamley & Company made a few saddles on the Wade trees. They were mostly scattered around northern Nevada, eastern Oregon, and southern Idaho, but had limited popularity. In 1961, Dale Harwood opened a saddle shop in southern Idaho. 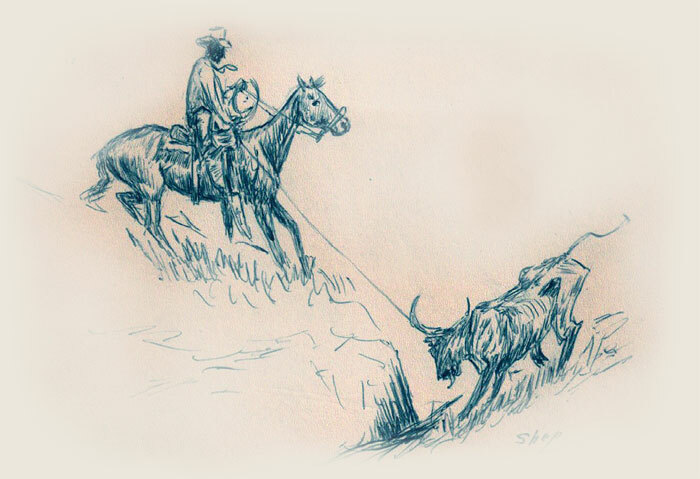 Harwood had buckarooed on ranches all over northern Nevada and Oregon. He started making saddles for working buckaroos. In 1962, Ray Hunt had Dale Harwood build him a saddle on a Wade tree. Harwood credits Ray Hunt with popularizing the Wade style of saddle by riding one in the many horse clinics Hunt conducted throughout the United States, Canada, and overseas. There are several reasons why Wade saddles remain popular today. The saddle sets low on a horse, giving a horse better leverage while holding heavy livestock that has been roped. The horn is low and out of the way when roping. The horn has a prominent lip to make dallying with your rope easier. Working buckaroos really like the saddle because of the way it fits a horse, never moving whether riding in steep mountains, or on the flats. Photo courtesy of Bryan Neubert: Tom Dorrance’s saddle copied by Hamley & Company from Clifford Wade’s saddle and then reworked by Dorrance and Walt Youngman. Currently owned by Jim and Luke Neubert. Tom Dorrance’s original saddle, shown on the right, was built on the first Wade tree. He wore it out and recovered it himself. It is currently owned by Jim and Luke Neubert, sons of Bryan Neubert, horse clinician from Alturas, California. The saddle was given to Bryan’s sons as a gift by Tom Dorrance in 1989. Article by Mike Laughlin, www.cowboyshowcase.com – A version of this article appeared in the July 2004 Western Horseman Magazine. Cowboy Showcase, home of the western spirit featuring authentic stories, western craftsmen, artists, horses, Dutch-oven cooking, and much more, provided permission to re-print this article.